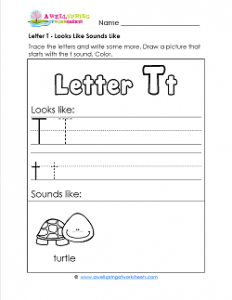 A fun little turtle graces this letter t looks like sounds like worksheet. His head is a little big – I wonder how he gets it inside his shell. We’ll just say this is what some of your kids drawings of something else that starts with t may look like. Cute, but a bit questionable. Ha ha! All said in fun. Kids have the opportunity to write the uppercase and lowercase Tt and draw a picture of a t word. Coloring, of course, is required!